Top 10 GM Vehicles for 2018 - Premier Chevrolet Cadillac Buick GMC Inc. The 2018 Chevrolet Cruze is Chevy’s worldwide best seller, and it’s no wonder, with such a huge range of possible configurations there is a Chevrolet Cruze for everyone. Available in sedan or hatchback, gas or diesel, automatic or manual transmissions, coupled with the 4 great trim options you really are spoiled for choice with this great subcompact car. The 2018 Chevrolet Cruze is includes some of the best tech features in the segment, loaded with gadgets to keep everyone happy! Great equipment like the 7 inch touchscreen, Chevrolet’s MyLink infotainment system, and rear back up camera are all fitted as standard. Don’t think for a moment that because the Cruze isn’t full size that there are no luxury options to choose from! With available leather and premium Bose audio, you’ll be amazed at how comfortable a subcompact can be. You’ll find great fuel efficiency in both diesel and gasoline options thanks to the turbocharged powertrains; allowing for more power from smaller displacements, the turbos fitted to each and every 2018 Chevy Cruze models really set it apart from the competition. The Cruze ranks amongst the most spacious vehicles in the segment, especially in hatchback form: with a cavernous trunk and fold-flat rear seats, the Chevy Cruze will challenge your perceptions of what is possible in a vehicle of this size. The Chevrolet Silverado 1500 is the number one selling vehicle in the GM lineup, and with good reason! Featuring a 5 year/100,000 mile warranty, you’ll find the 2018 Silverado to be a dependable truck that will provide years and years of service, and whether you plan to use it as a job site workhorse, or a comfortable family cruiser, the Chevy Silverado will always get the job done. The Silverado’s configuration options truly feel endless, with a choice of three cabs; Regular Cab, Double Cab or Crew Cab, a choice of 3 bed lengths; short, regular or long, as well as a choice of up to 8 trims; starting with the basic work truck and going all the way through to luxurious. In 2018, regardless of the trim you choose, you’ll find an even bigger selection of fantastic, as standard equipment, including many items only found as optional extras on previous model years! Every Silverado now features a 7 inch touchscreen display, Chevrolet MyLink infotainment, Apple CarPlay and Android Auto smartphone connectivity, and much more. Available extras include luxury features like heated and ventilated seats, top quality leather upholstery, and Bose premium audio. The 2018 Chevrolet Equinox is out to make a big statement. This new Equinox, refreshed for 2018, has become smaller and lighter without any significant reduction to interior dimensions, this benefits both performance and fuel economy without sacrificing comfort. To further assist the gas savings, the 2018 Equinox is fitted as standard with engine stop/start, a feature that automatically cuts the engine when the vehicle comes to a stop, and restarts as you left off the brake. If you’re likely to undertake regular, long journeys then consider the Chevy Equinox turbodiesel, you’ll enjoy long breaks between trips to the gas pump without the downsides of driving the diesel cars of old! Chevy’s range of driver aids can be added to the Equinox range to compliment this already safe compact SUV. Features such as lane keep assist, low speed automatic forward braking and forward collision alert work seamlessly with the driver to provide a confident and safe driving experience. Infotainment is provided by the MyLink system, displayed through the standard 7 inch touchscreen display, and supplemented by both Apple CarPlay and Android Auto for smartphone connectivity that no matter which smartphone you use. The 2018 Chevrolet Camaro promises to dominate, both on the road and track, and with a performance pedigree as renowned the Camaro’s, that’s a promise you can rely on. The 2018 Camaro has 4 powertrains to choose from, starting with the 2.0 liter turbocharged; featuring 275 horsepower and stunning good looks, right through to the 6.2 liter supercharged ZL1, with a monstrous 650 horsepower and boasting a 0-60 miles per hour time of just 3.5 seconds. The 2018 Chevy Camaro has an interior to match the impressive performance statistics, the cabin is ergonomically laid out, ensuring the driver has access to all buttons and switches without having to take focus away from the road ahead. It also features driver centric tech, such as a performance data recorder, as well as a line-lock system for tire warming before hitting the track. In any performance car, the ability to stop quickly is as important as the ability to accelerate; the available Brembo 6 piston front and 4 piston rear performance braking system is amongst the very best in vehicle stopping equipment, giving you the confidence to drive your Camaro to the limit. The all new 2018 Chevrolet Traverse has all the space you’d ever need and then some! With seating for a total of eight (driver included), and class leading cargo space, the Chevy Traverse maximizes every last cubic inch in the most practical ways. The new Traverse returns with bold exterior styling, as well as premium interior appointments, including high quality leather upholstery with accent stitching, Bose premium audio, and heated and ventilated seating. The available all wheel drive system provides traction in challenging conditions, sending power where the stability control system detects that it is needed. Two powertrains are available, a 2.0 liter turbocharged inline 4, with 255 horsepower, or a 3.6 liter V6, naturally aspirated with variable valve timing and 310 horsepower. Both powertrains are mated to an excellent 9 speed automatic transmission for smooth gear changes and effortless power on the 2018 Traverse. The GMC Sierra 1500 is a truck that truly does it all. With rugged looks, and the off road ability to match, this vehicle is ‘Professional Grade’. Even if your truck is unlikely to see anything other than suburban roads, the GMC Sierra has you covered, with upscale trims such as the SLT or the legendary, range topping Denali this is about as luxurious as half-ton trucks get. No amount of luxury interior appointment takes away from the Sierra’s raw ability, with a n available max trailering limit of as much as 12500 lb, this truck can really tow! There are 3 powertrains to choose from, including GMC’s mighty 6.2 liter V8 with its huge 420 horsepower and 460 lb-ft of torque. You’ll be impressed with the incredible interior tech, with available wireless cellphone charging, 4G LTE WiFi hotspot, and Bose Premium Audio. The Chevrolet Tahoe is a red blooded, full-size SUV, as capable towing big payloads as it is ferrying the entire family around the town in opulent luxury. The new 2018 Tahoe is loaded with family oriented tech, keeping you and your passengers connected and entertained wherever you go! Features include 4G LTE WiFi connectivity, an available seven USB ports, available Bose premium audio system, and 110v power outlet. Apple CarPlay and Android Auto smartphone connectivity are standard, as is the 8 inch touchscreen infotainment display. The Chevy Tahoe is powered by an aluminum-block 5.3 liter V8 engine, with 355 horsepower, and 383 lb-ft of torque. Variable valve timing provides effective torque throughout the rev range, ensuring that this engine doesn’t struggle under load. The electronically controlled 6-speed automatic transmission delivers the power smoothly, and features a tow/haul mode, and the available Magnetic Ride Control suspension package provides real-time damping with the use of a dual coil receptor, improving responsiveness, reduces body roll, enhances traction for more accurate steering, and is constantly adapting to changing road conditions for an incredibly comfortable ride. The Tahoe is available in both 2 wheel drive and 4 wheel drive, giving you the option to choose the drivetrain that best suits your needs and lifestyle. The Cadillac XT5 is the latest luxury crossover from the famous marque. Featuring only the very best in luxury materials, and some of the finest craftsmanship in any crossover on the market, the XT5 far exceeds expectations of what can be achieved in this section of the market. To accompany the luxury fixtures and fittings, the 2018 XT5 features some excellent infotainment tech, including standard Bose audio, Apple CarPlay and Android Auto. The Caddy is powered by a smart 3.6 liter V6, good for 310 horsepower. To further increase the fuel economy of this already efficient powertrain, the XT5 has the capability to automatically shut down 2 of its cylinders when load is low, effectively making this a V4. When more power is needed, the extra cylinders will automatically power up again, so seamlessly you’d never even know! This engine is mated to a smooth 8-speed automatic transmission for effortless power delivery, aided by Cadillac’s Performance Algorithm Shifting technology for seamless adaptation to ever changing road conditions. Buick are out to challenge your perception of luxury with the new 2018 Regal. With as-standard features more usually considered as optional extras, the beautifully appointed Regal is certainly impressive. Leather appointed upholstery is the order of the day across all trim levels, as is the 8 inch high resolution touch screen infotainment display. Available with a choice of two powertrains, the 2.4 liter naturally aspirated DOHC, with 182 horsepower, or the turbocharged 2.0 liter inline 4, with its 259 horsepower and 295 lb-ft of torque. The Buick regal can be had in either front wheel drive, or all wheel drive configurations. 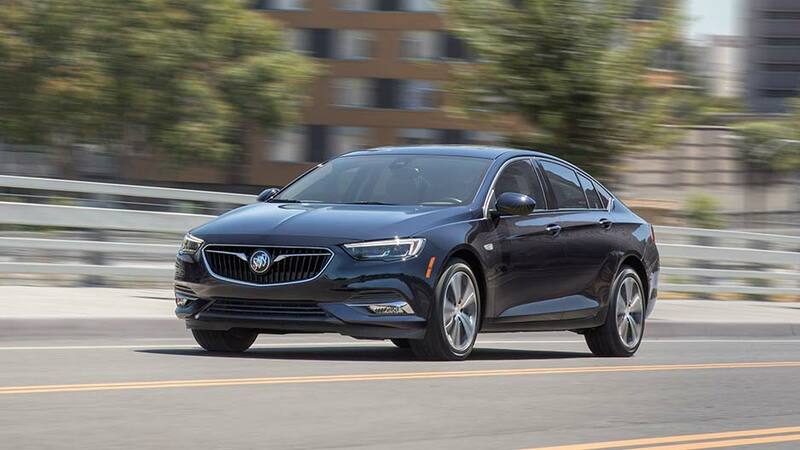 If you’re looking for something sporty as well as luxurious, the Buick Regal GS is the one for you; featuring upgraded suspension, Brembo braking system, 19 inch alloy wheels, and GS exclusive front and rear fascia, and rear spoiler. The 2018 Chevrolet Volt plug-in hybrid is good for as much as 53 miles on the electric motor alone! On a full charge and with a full gas tank, the 2018 Volt is capable of a combined 420 miles, eliminating the ‘range anxiety’ that puts many off the idea of an electric vehicle. In addition, with regular charging, Chevy estimates an astonishing 1100 miles between gas fill-ups, an incredible figure by any account. Chevrolet have included some incredible tech with the 2018 Volt, including on demand regenerative braking; by simply activating a paddle on the steering wheel you can slow the vehicle to a stop, in the process the car recovers the energy usually wasted during braking and reconverts it into electricity, assisting with battery recharge on the move! As well as the excellent EV tech, this Chevy Volt still features some of the best infotainment equipment in the segment, with the MyLink system, touchscreen display, Apple CarPlay and Android Auto all fitted as standard. The interiors are beautifully appointed, thoughtfully laid out, and thoroughly modern in design. The above GM vehicles are some of the best cars available at your Windsor GM dealer in 2018. To see these and the rest of the amazing 2018 lineup, visit Dan Kane GM dealerships in Windsor, Ontario. Call ahead to set up a test drive, or drop in any time. We can’t wait to see you!